In March 2004, the cities of the Cerritos Community College District passed a bond measure to provide $210 million to repair and renovate the Cerritos College campus. Then, in November 2012, while still reeling from the effects of the Great Recession, the community passed yet another bond measure, Measure G, which proposed an additional $350 million in bonds. That measure passed with 70% of the vote. That’s a stunning pledge of $560 million in less than a decade. Clearly, the community has done its part in supporting Cerritos College. Unfortunately, the same cannot be said of the Cerritos College Board of Trustees, which has not come close to matching the communities’ commitment to the students and to the faculty. Indeed, it seems that the Board has chosen to do the opposite. Consider the following table. 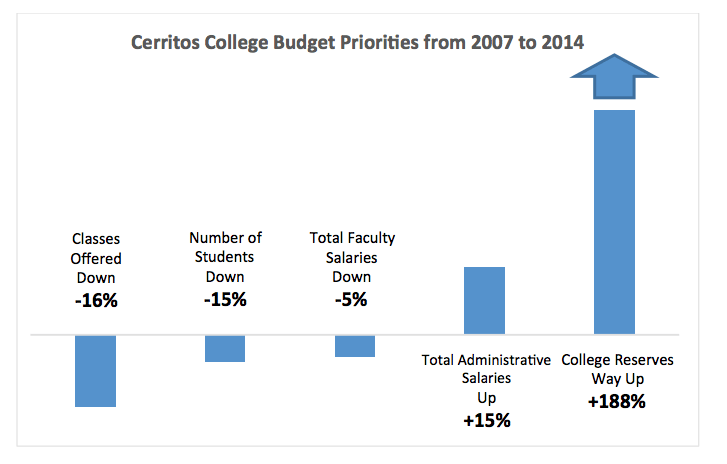 From 2007 to 2014, Cerritos College cut classes by 16%. The number of students is down 6%. Faculty salaries – down 5%. Notice the salaries of administrators are up 15%. Worse, though, is the bloated reserves, the consequence of the perverse notion that a public college should not be using money to educate students but should instead be parking that money in a bank, which, in effect, renders that money useless. Reserves are up 188%. According to the California Community College State Chancellor’s office, “For every $1 California invests in students who graduate from college, it will receive a net return on investment of $4.50.” That’s a 350% return on investment. Californians have invested generously in Cerritos College—so much so that, at present, Cerritos College has a $46.3 million surplus. In the bank, that surplus earns about 3%. If it were invested in students and their teachers, it could be earning something closer to 350%. Hoarding reserves, it could be argued, squanders about 347%. 347% of $46.3 million is $161 million. Per year. Made unavailable to the college. In 2009-10, the District cut classes campus-wide by 10%, packing the classes that were offered and turning away those who couldn’t get it, while at the same time it was banking some $28 million. In 2013, when the District threatened to cut summer school altogether, claiming it was a necessary act of efficiency, the faculty agreed to about a 50% cut in summer school pay to keep the school open. Perhaps one of the more revealing facts of the Board’s priorities is how Cerritos College treats our part-time faculty. We have a total of 838 faculty, of whom 575 are part-time. Most are not part-time by choice, for the job pays little, provides no security, and offers neither health nor retirement benefits. Yet within our region, part-time faculty have it worse than anywhere else. Cerritos pays part-time faculty the least, and that difference is not small. A new hire with a Master’s degree at Cerritos College makes $2877.66 for a semester of teaching a 3-unit class. That same newbie teaching the same 3-unit class at El Camino makes $4388.58 for the semester. This makes teaching at Cerritos less attractive, it encourages high turnover, it increases administrative costs, it drains time and energy for recruitment and training, and it all but guarantees that Cerritos College students are taught by energetic and devoted faculty who are inevitably among the least experienced in the region. The community has honored the college, and the Cerritos College faculty are immensely grateful, not just for the bond measures passed but more for the faith and trust the families and the students have vested in the college. What we need now is for the Board of Trustees to reflect the communities they serve and extend a measure of belief in the college, as well.